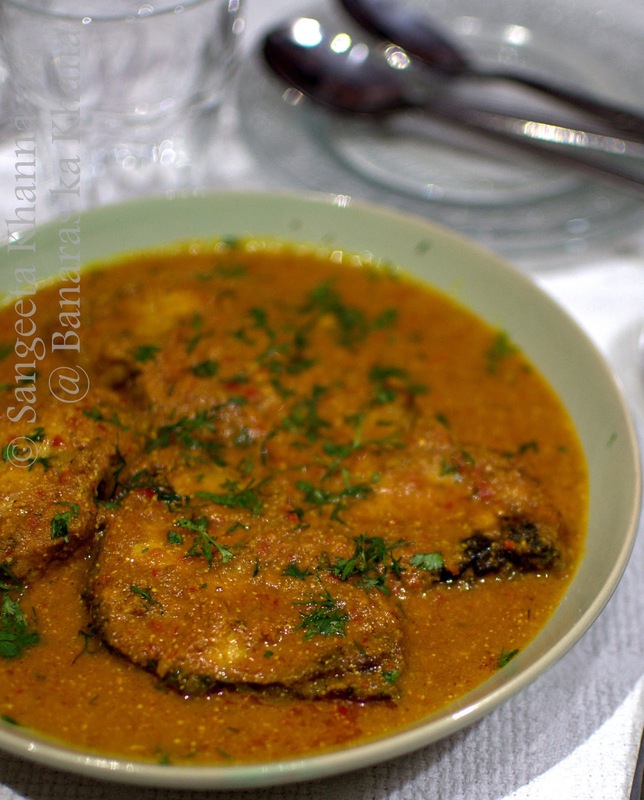 Sarson wali machhli or any mustard seeds gravy is something synonymous with Bengali food but it is an integral part of UP food too. 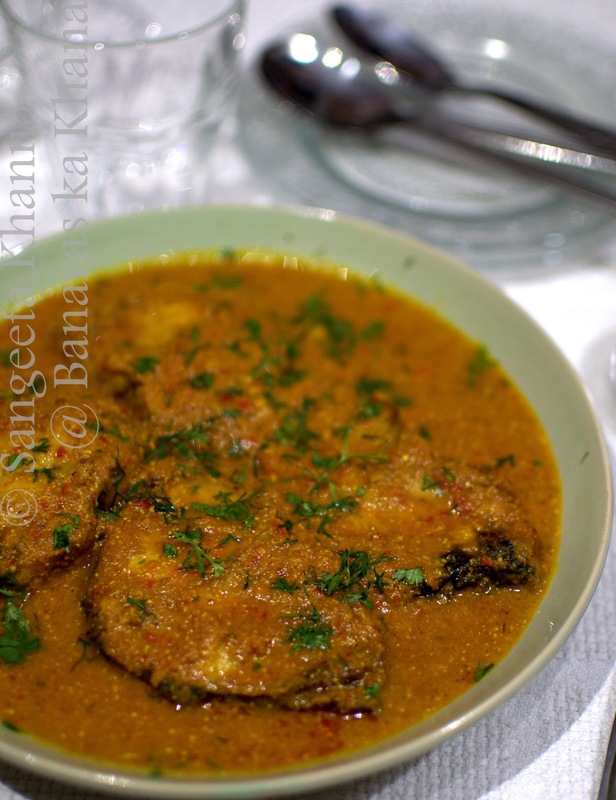 There is difference between the way it is cooked in Bengal and in UP though, in a Bengali sorshe jhol the taste of the mustard is prominent and the curry is a bit milky in appearance but in UP it becomes infused with garam masala and amchoor and the curry becomes brown n rich in color. I like it both ways. Both the curries are very distinctly different in the final bouquet of flavors. 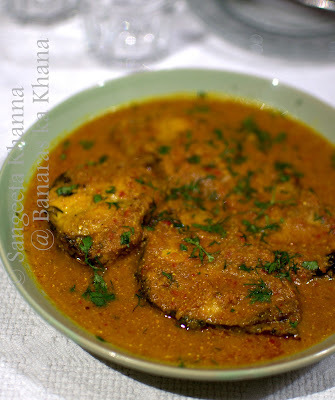 Actually I started eating fish much later in life and learned to cook fish from Bengali friends of mine, and that was my first preference for a long time, but then I learned the way my mom and grandmother used to cook it too. I love this curry both ways now. you need for this preparation I used a large fish, cooking process differs with the size of the fish. I used 4 large pieces (steaks) of fish weighing about 500 gm total. Any fish will be fine but Rohu or Catla (river fish) are more suitable for this curry. Rub some salt and turmeric powder to the pieces and let it rest for half an hour. Heat oil in a shallow pan and fry the fish pieces both sides until golden brown and keep aside. Now empty the pan just keeping 2 tbsp of oil into it, throw in the cumin seeds and let it splutter, add the ginger garlic green chilly paste and fry till oil separates, throw in the powder masalas, fry for a minute and add the mustard paste. Mix well and cook for a while, then add the tomato paste to the pan. Add salt and cook covered on medium heat till oil separates again. Now add about 1.5 cup of water to it. More or less depending how thin or thick gravy you want. Let it boil and drop in the fried fish pieces. Cook covered till oil separates and the fish is done. Throw in coriander leaves and put off the flame and keep the pan covered for 5 minuted so that the coriander leaves infuse their flavor into the curry. Machhli chawal was a comfort food in our household but now I make it rarely as fish is not readily available in our locality. I miss the days when a machhli wali used to come to my doorstep when we were in Dhanbad, Arvind's previous posting. Small towns have their own charm and fresh produce is one of those lovely things that you get without any extra effort. Fish curry looks very delicious! Glad to see your mom's recipe. Mom's recipes are always special! I am sorry for a late reply anonymous ..i have corrected the mistake and now it's clear that mustard seeds has to be made into a paste n added after the powdered spices. Thanks sangeeta I will try to make as in heat of Delhi fish is a cool option. I m making this for my mom hope it come with good news.